The pipes will hang under the car, under the tunnel, hold on by brackets and exiting at the front just before the anti-sway bar. But I am not sure about that yet, it might also go upwards somewhere where all the steering gear is. But there is not a lot of room, because the steering rods need room to move. The most interesting thing in this diagram is the way the coolant pipes are connected at the back. The connections on the radiator and on the engine are swapped, because the engine is swapped around compared to its original position in the Alfa Romeo. This means I have to cross the coolant pipes somewhere. I think the best place to do it is in the back. In the front there is not enough room and it could compromise airflow. I decided to make the two pipes exit at the same (left hand side) of the car. Then crossing the pipes can more easily be done around/above the gearbox. edit 22-03-2008: I bought 3 exhaust pipes. These are all 3 metres long and have a 32 mm ( 1 1/4 inch) diameter. Great site. Great conversion. My name is George. 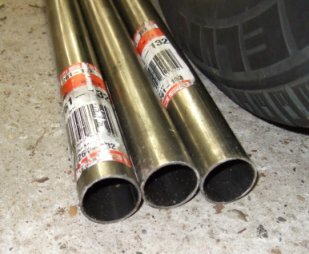 One question about coolant pipes and electrolysis or diabrosis. 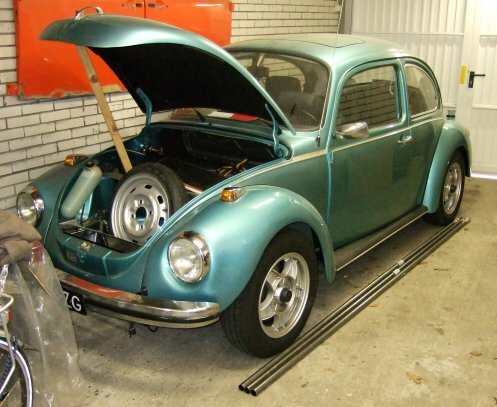 After reading tones of Infos about this Thema many people who made subaru or alfa romeo engines conversion to their beetles claim that the difference between 2 metals for example aluminium block and stainless steel coolant pipes is very bad idea because this can create diabrosis or electrolysis and eat the softer aluminium engine case. What is your opinion about this and what did you do to prevent this. I didn’t do anything to prevent it, because I think it is not an issue. It’s only an issue when the two metals touch, which in my case it doesn’t. Also, every coolant should contain anti-freeze, something to lubricate the waterpump and rust-protection. Another thing that convinced me that this is not an issue, is the way my engine is build. My engine has alumium heads and a cast iron crankcase. The coolant flows through the heads (aluminum), and past the cylinders in the crankcase (iron). If it was an issue, then this engine was not built like this by the factory.